Familial retinoblastoma affects more than one member of the same family. Diagnosing children early provides the best opportunities for life and sight-saving care. Alison Skalet M.D. 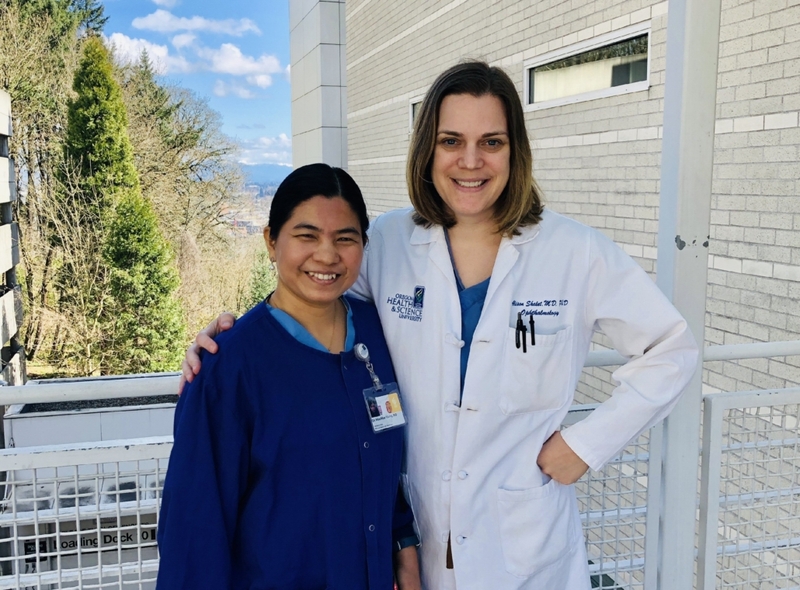 PhD, ocular oncologist and director of the Retinoblastoma Service at Casey Eye Institute, Oregon Health & Science University, explores opportunities for early diagnosis when a parent, sibling or other relative has already been diagnosed. Director, Ocular Oncology Service, Wills Eye Hospital, Philadelphia, USA. Dr. Skalet examines a child under anesthesia. Published with permission. Incredible advances in treatment for retinoblastoma have been made in recent decades. In high income countries, most children survive retinoblastoma and retain vision in at least one eye. Tumor location as well as size influence vision outcome. Nonetheless, better outcomes and less intensive treatment regimens may be possible when children are diagnosed when tumors are small. Most children without a family history of retinoblastoma are diagnosed only after they develop a relatively large tumor that affects the vision and causes signs like strabismus (turning of the eye) or leukocoria (a white light reflex in the eye). However, in children with a family history of retinoblastoma, who may be at higher risk than other children for developing the disease, we have opportunity to detect tumors earlier. This is possible when children at elevated risk undergo dilated eye examinations to detect tumors before they cause symptoms or obvious signs. It is important families and health care professionals know that children in families with retinoblastoma benefit from early screening for tumors by an ophthalmologist. Screening for familial retinoblastoma is very important to me. From 2015-2017, I was privileged to work with a group of North American experts developing the first national guidelines for screening children for familial retinoblastoma in the United States. In this post, I will highlight some exciting retinoblastoma research presented at the recent International Society of Ocular Oncology (ISOO) meeting in Los Angeles, California. I will then explore screening strategies for familial retinoblastoma in the United States and around the world. It is important for families to understand there are a variety of approaches to screening. 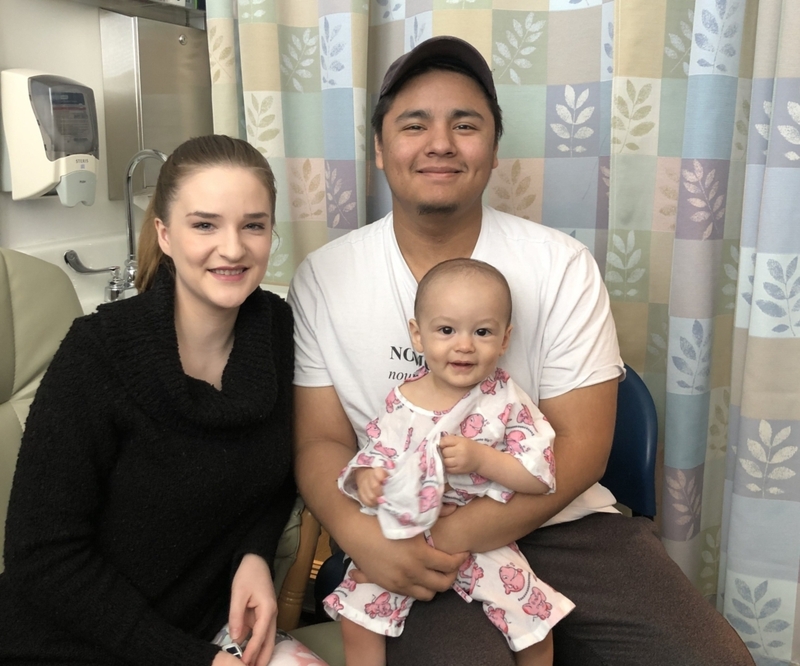 I will leave you with the compelling story of how one mother moved from the role of family member to clinical researcher and how she, and parents like her, are impacting research priorities in retinoblastoma. In March, at ISOO 2019, I joined retinoblastoma specialists from around the world to learn about advances in diagnosis and treatment. Exciting topics included work in drug discovery and developing methods for “liquid biopsy” to help diagnose retinoblastoma and potentially personalize treatment. A symposium, “Intra-Arterial Chemotherapy and Intravitreal Chemotherapy Regimens and What We’ve Learned from the Children’s Oncology Group and European Trials” focused on the need for collaboration on prospective trials (research studies that follow patients forward in time). Dr. Brenda Gallie presented the inaugural Dr. Linn Murphee Lecture, “Linn’s Legacy: Bright Future for Retinoblastoma” in which she highlighted Depict Health, a comprehensive retinoblastoma documentation, communication, and research tool soon to roll-out in Canada and later become available for international collaborative care and research. 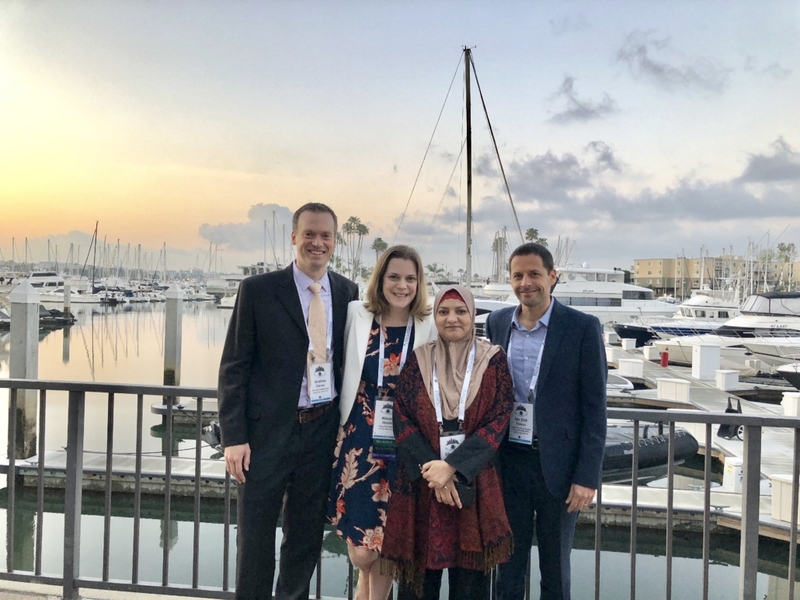 Many talks presented at ISOO 2019 focused upon advancing retinoblastoma care in countries around the world through clinician education, public outreach, and collaborative research. Drs. Andrew Stacey, Alison Skalet, Shabana Chaudry, and Ido Didi Fabian at ISOO 2019. My talk focused on the IRIS Registry, which uses automated data transfer to create a “big data” database for ophthalmology care in the United States. I am honored to lead a group of ocular oncologists in a pilot study evaluating the IRIS Registry to research ocular tumors like retinoblastoma. We hope this will give us a better idea of what is happening in the “real world” with regards to screening, treatment, and outcomes for retinoblastoma in the United States. The most impressive display of collaborative spirit was the work presented by Dr. Ido Didi Fabian and his collaborator, Dr. Andrew Stacey. Dr. Fabian led the first worldwide collaborative study in ocular oncology – “Global Retinoblastoma Presentation 2017.” This study included data from hundreds of centers around the world. According to Dr. Fabian, “We focused on the presentation mode of retinoblastoma patients, as this is one of the most significant risk factors to predict outcome. We managed to enroll more than 50% of the predicted global annual incidence of retinoblastoma – more than 4,000 patients in 2017, and create an up to date global database. Dr. Fabian and his collaborators at the Retinoblastoma Network, and the many contributing centers have achieved something truly outstanding. The new network holds great promise for future research. One area worth exploring in future collaborative work is different screening strategies used by doctors in countries around the world to diagnose retinoblastoma when there is a family history of the disease. A family prepare for a screening examination under anesthesia. Published with permission. Most cases of retinoblastoma are not inherited, but retinoblastoma does “run in the family” for some. For this reason, children with a family history benefit from systematic screening, including dilated eye exams by an ophthalmologist. In the United States, the first national guidelines for retinoblastoma screening were published in 2018. Our goal in creating the guidelines was to increase awareness about retinoblastoma and create a systematic approach to screening that was accessible to pediatricians and local ophthalmologists who are often caring for these children. We sought to ensure that no child with family history of retinoblastoma in the U.S. lacked access to care including early, thorough, and serial eye examinations by an ophthalmologist. The U.S. guidelines also emphasize the importance of genetic testing in clarifying risk. Despite its importance in modifying care, genetic testing has not been universally available to all children at risk in the U.S. due to lack of insurance coverage. We hope improved insurance coverage for screening examinations and genetic testing will result from publication of the guidelines. There are a variety of approaches to screening examinations. Some children live close to a retinoblastoma expert and are screened by that doctor. Others rely on pediatric ophthalmologists, retinal specialists, or general ophthalmologists for screening. Some expert doctors prefer to examine children under anesthesia (EUA) while others prefer to examine children awake in clinic. Opinions differed among the experts involved in creating the guidelines regarding preferred examination technique (EUA or awake), so the U.S. guidelines do not specifically recommend one approach over the other. Dilated eye exams by an ophthalmologist are recommended for children with elevated retinoblastoma risk due to family history. All children with a family history of retinoblastoma benefit from genetic counseling and testing to clarify their risk. Children are stratified into high, intermediate, and low risk categories. Frequency of examinations recommended varies based upon a child’s age and level of risk, decreasing in frequency for all children as they grow older. 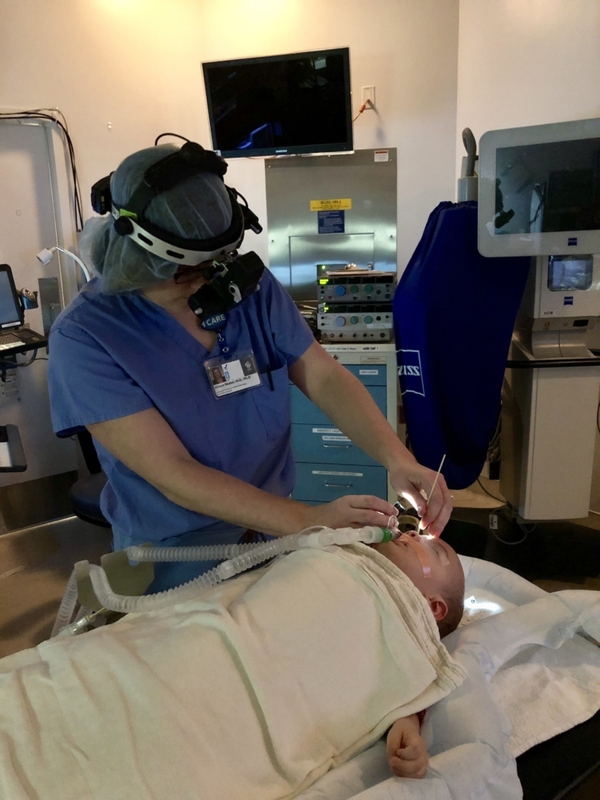 Children may benefit from examinations under anesthesia (EUA), and many medical groups prefer this approach for children in higher risk categories. Specific care decisions regarding screening, including whether to choose an awake exam in clinic or an EUA, are best made in consultation with a child’s family; however anesthesia is strongly recommended for a child unable to participate in an awake exam. Examinations are continued until a child is 7 years of age, or has tested negative for their relative’s known RB1 mutation. 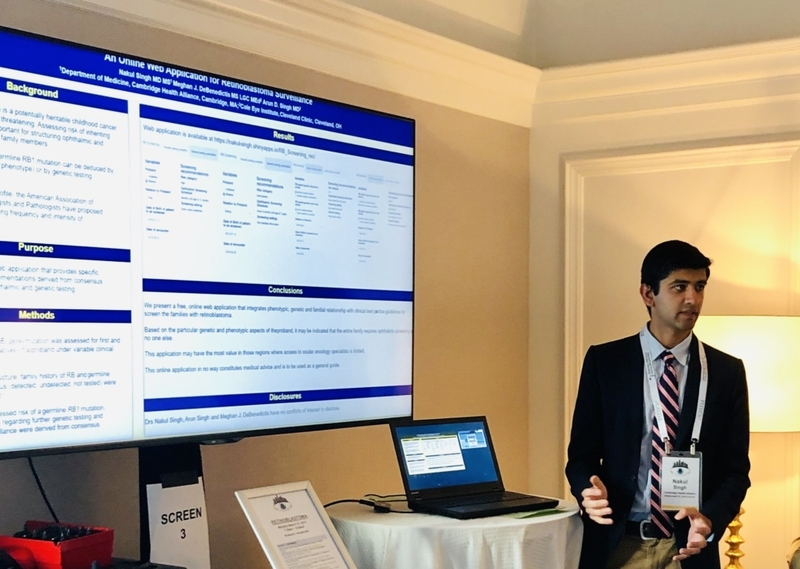 Dr. Nakul Singh presents his poster at ISOO 2019. Working with his father, Dr. Arun Singh of the Cleveland Clinic, Dr. Nakul Singh has developed a web-based application to assist clinicians in choosing a screening program for children with family history of retinoblastoma based upon the U.S. guidelines. He presented this work as a poster at ISOO 2019. Using new, widely accessible technology like apps to aid in early diagnosis of pediatric eye diseases is an emerging area. For example, there are currently apps available to screen for refractive errors and strabismus. There are also apps designed to detect leukocoria – the white pupillary reflex seen in eyes with retinoblastoma. One father is developing such an app. The Singhs and their collaborators hope that making the U.S. guidelines accessible and easy to use will improve care for children at risk for familial retinoblastoma. The web application, once finalized, will be freely available to physicians and families. The published U.S. guidelines provide a useful, structured approach to familial retinoblastoma screening, but the strategy described is not the only valid approach. Your child’s retinoblastoma specialist may recommend a different strategy. For example, Dr. David Abramson, Chief of the Ophthalmic Oncology service at Memorial Sloan-Kettering Cancer Center, takes a different approach, for reasons he describes in a Letter to the Editor. Our co-author response can be viewed here. Drs. 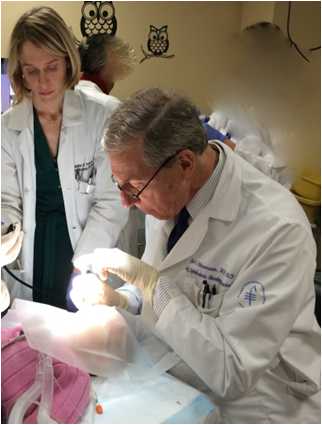 David Abramson and Jasmine Francis perform an intravitreal injection for a child with retinoblastoma. Active discussions continue among retinoblastoma specialists regarding the optimal approach to screening. The best approach for a particular child often will depend upon multiple factors, including local resources and expertise, and availability of genetic testing. Examinations are recommended frequently during early infancy, when most children with familial retinoblastoma develop the disease. Genetic testing, when available, improves care. At ISOO 2019, I discussed retinoblastoma screening strategies with colleagues from around the world. For each country, physicians emphasized the importance of combining public education and outreach together with a structured examination strategy. The outreach and examination strategies varied based upon the resources available, unique challenges, and particular strengths of each country. Dr. Alison Skalet and Dr. Moe Moe Hliang, a visiting ophthalmologist from Myanmar, at the Casey Eye Institute in Portland, Oregon. Registry-based research regarding the presentation of retinoblastoma has provided excellent data to guide screening in the Netherlands. Dr. Annette Moll, of the Retinoblastoma Center of the Netherlands, has led much of this work. Most children are screened by expert retinoblastoma specialists in Amsterdam. Children are examined on a rigorous schedule including examinations under anesthesia until age 3 years. After age 4 years, examinations are discontinued. Dr. Fabian examines a child for retinoblastoma. Dr. Fabian shared his experience of screening children in Tel Aviv, Israel. “In Israel there are 2 centers treating retinoblastoma and no national guidelines, yet. A protocol is used, so patients at risk (with family history of Rb) undergo screening examinations under anesthesia at regular intervals, from [birth]. Other clinical and genetic factors are also taken into account so a plan is tailored for each patient accordingly. Brazil is a vast country with diverse cultures and social / economic experience, raising particular challenges for screening. Dr. Teixeira remarks, “Many families cannot pay for care and children must often travel long distances to see a retinoblastoma specialist. We try to help the child and family in all aspects: diagnosis, access to treatment, and support during the treatment. We have all kinds of treatment for free. After treatment we have a program of visual rehabilitation.” Genetic testing is not yet available to all children in Brazil, but a center for genetic testing is being developed at the pediatric oncology institute in Sao Paolo. Dr. Teixeira and his team treated more than 100 new retinoblastoma patients last year. 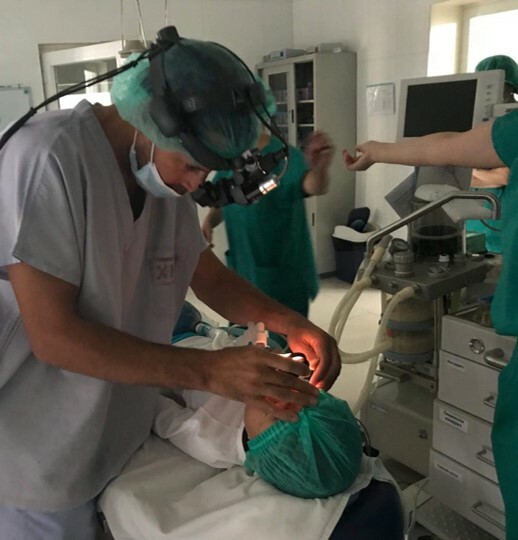 In addition to clinical care provided in the capital, Sao Paolo, they have been working in different ways to improve diagnosis and treatment across Brazil. National campaigns educate doctors and the population about retinoblastoma, and they have designated September 18 as a national day to promote early diagnosis. 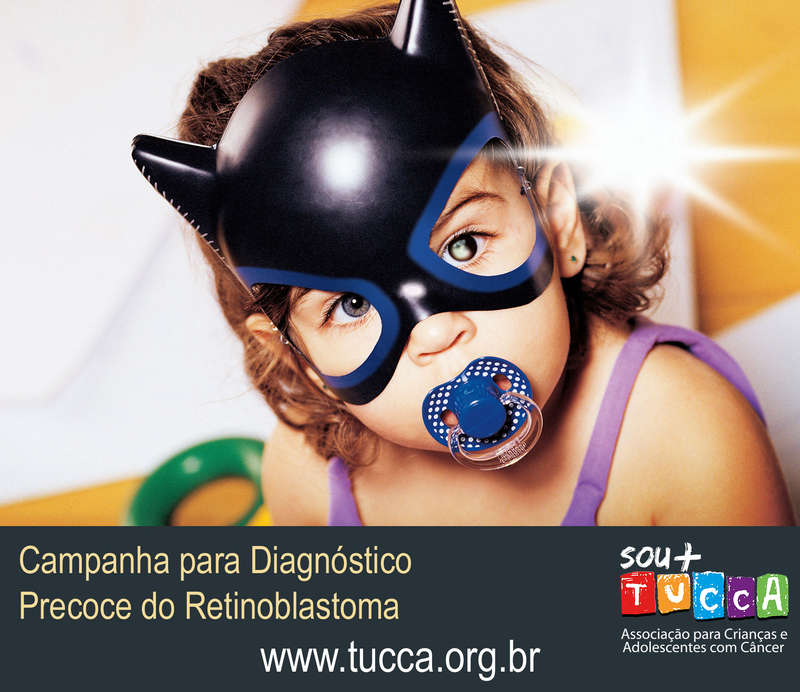 Promotional poster for the Campaign for Early Diagnosis of Retinoblastoma, Brazil. A particular problem Dr. Chaudry notes, is “Trying to convince families to allow screening.” She explains that due to late diagnosis of the first child in a family, “Parents think their child will die like their sibling [who had retinoblastoma] even if diagnosed early, and they prefer their child to die at home.“ In Pakistan, there are ongoing campaigns to increase awareness that early diagnosis can save lives and vision. 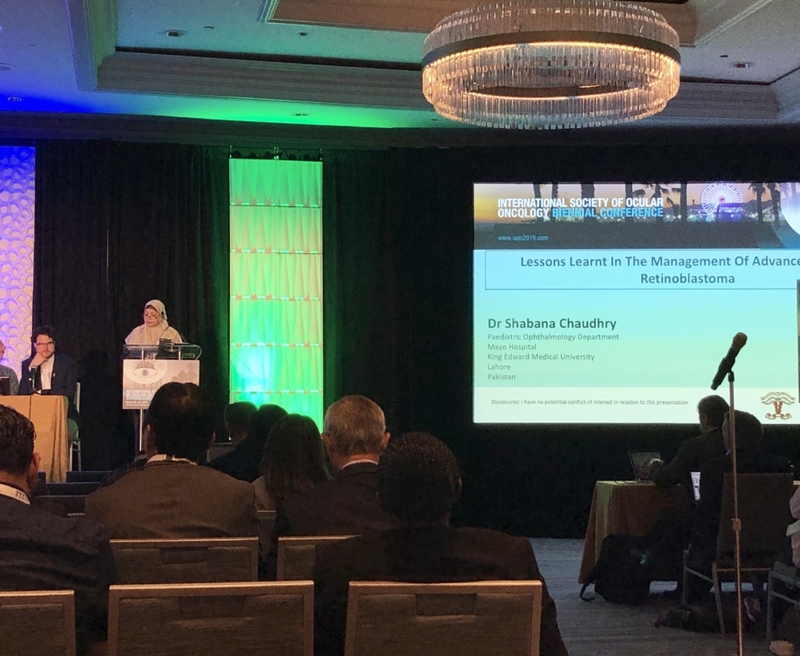 Dr. Chaudry presents her work at ISOO 2019. A survey of survivors, families, physicians, and researchers was conducted to create a priority list of 10 research questions. The work highlights what families living with retinoblastoma feel are the most critical research issues, buoyed by the support and expertise of clinician and researcher partners. Top of the list was early diagnosis for children with retinoblastoma – both those who are the first in their family with the disease and those who have a family history of Rb. One of the most impactful ways we can diagnose children early is by rigorous screening for familial retinoblastoma. Ivana explains, “We first found out my son had retinoblastoma when he was 3.5 months old. He was admitted to SickKids Hospital in Toronto. I remember it was a Friday night after everything was closed. After the shock of hearing ‘cancer’ associated with a newborn baby settled in, I began to wonder, what does this mean for us as a family? We always were interested in having more kids. Would this change the idea of the family structure that we originally had hoped for? This was a big question. The second was that our son was the first kid in our family with retinoblastoma. Is this a bigger picture thing? Is this going to affect our siblings and their future children? Where does this come from? Does one of us have something? 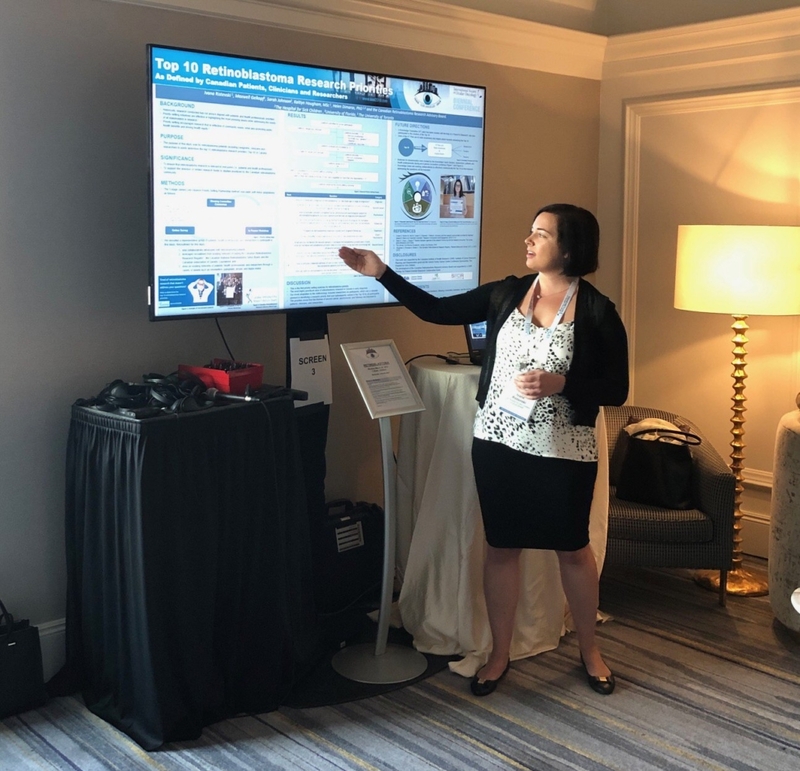 Ivana Ristevski presents her poster at ISOO 2019. After beginning to read scientific articles about retinoblastoma, Ivana reports, “I finally came to the realization that the researchers are experts in their fields, but we, the parents, are experts in the journey. 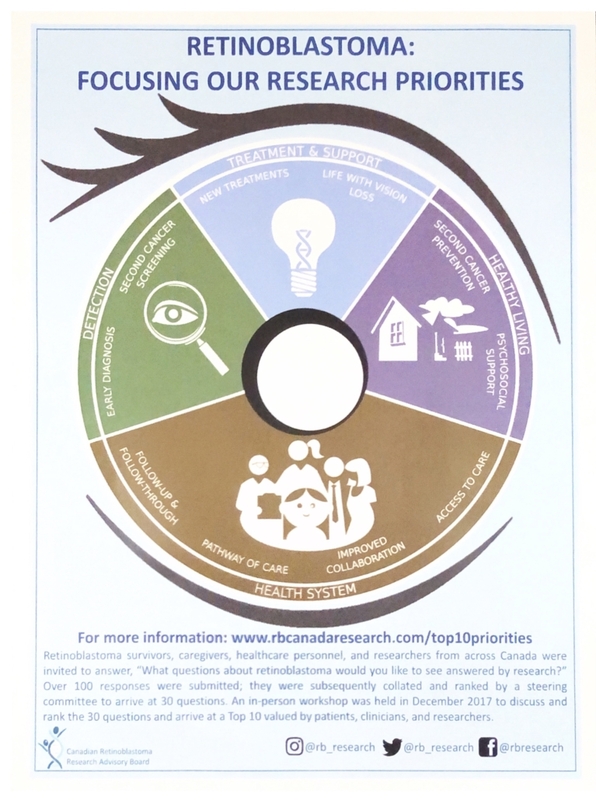 Retinoblastoma: Focusing Our Research Priorities handout. Click to view large image. As physicians caring for children with retinoblastoma, we recognize the importance of partnering with parents in making screening and care decisions. These decisions are often not straightforward, and care for retinoblastoma is rapidly evolving. This brings a lot of hope for better outcomes, but also can be associated with stress, as we try to determine the best approach for each child and family. While retinoblastoma specialists are experienced in collaborating with families to make care decisions, collaboration in research with survivors and families is an exciting new step. I am eager to see where this partnership leads. 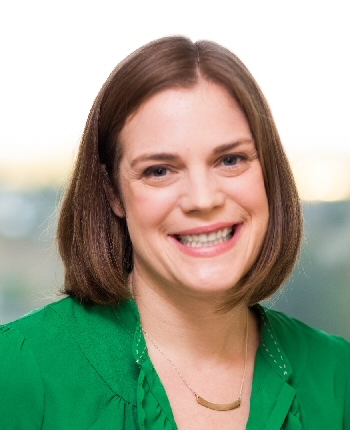 Dr. Alison Skalet, MD PhD is an ocular oncologist, Associate Professor of Ophthalmology and Adjunct Associate Professor of Radiation Medicine at the Oregon Health & Science University’s Casey Eye Institute in Portland, Oregon, USA, where she directs the retinoblastoma service. She combines a busy clinical practice with clinical and translational research. Dr. Skalet has enjoyed serving on multiple national and international subspecialty committees for the American Academy of Ophthalmology, American Board of Ophthalmology, American Association of Ophthalmic Oncologists and Pathologists, and the International Society of Ocular Oncology.